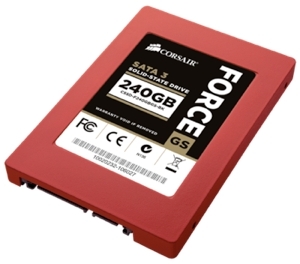 Corsair has added a new member to its Force family of solid-state drives. The Force Series GS combines the current-generation SF-2281 controller with Toggle DDR NAND to create its fastest SSD yet, achieving maximum random 4k write performance of up to 90K IOPS. The Force Series GS SSDs features SATA 6Gb/s connectivity, TRIM support to maintain performance over time, and low power operation for longer battery life in notebooks. The 2.5-inch form factor drives also ship with a 3.5-inch adapter so they can be easily installed into notebooks or desktop PCs. Corsair ran the 240GB model though some tests and posted the results in its blog — they fare quite well as you’d expect. The new Force GS drives include a 3-year limited warranty and will be available immediately from online retailers. Newegg has the 180GB and 360GB versions listed for $175 and $320, respectively.